Review by AllTheBestFights.com: 2018-05-05, good exchanges between Tony Bellew and David Haye 2: it gets three stars. 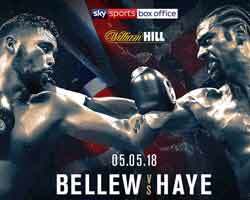 The former Wbc Cw champion Tony Bellew entered this fight with a pro record of 29-2-1 (19 knockouts) while his opponent, the former world champion in two different weight classes David Haye, has an official boxing record of 28-3-0 (26 KOs=93%). Both boxers are not ranked as they haven’t fought since March 4, 2017 when ‘Bomber’ Bellew defeated ‘Hayemaker’ in their first bout, via tko in eleven round (Haye suffered a ruptured Achilles tendon in the sixth period while Bellew broke is hand – David Haye vs Tony Bellew I). Before their first fight Tony suffered his last loss against Adonis Stevenson in 2013 (Stevenson vs Bellew) but then he had won eight consecutive fights while David was defeated by Wladimir Klitschko in 2011 (Klitschko vs Haye) and then collected three victories. Bellew vs Haye 2 is the main event of the evening. Watch the video and rate this fight!